Have you ever heard someone quote the Bible and think “you totally missed the point?” Actually, this “missing the point” business happens more often than you think. It is so easy to misunderstand Scripture, and I think it is especially easy to misinterpret Old Testament stories. They are so far removed from our time and our culture that sometimes we read them and pull out things that just aren’t there. The good news is that you don’t have to misinterpret Old Testament stories just because you were born in a different time and place. The Bible was written for you, for YOUR real life, and that means it is possible for you to (mostly) understand it. I say “mostly” because there are some things in Scripture that are true (because they’re in the Bible) but we don’t really understand what they mean yet. And there are other things that might just take more work or more time and maturity and even life experience to understand. But most of the Bible we can understand – correctly – and these Old Testament stories can have a tremendous impact on our life with God if we can learn how to read them. 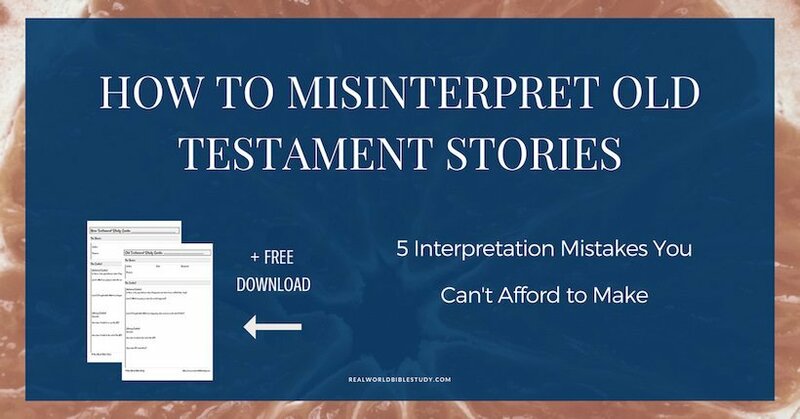 So here are 5 ways we misinterpret Old Testament stories. The Bible was written for our real lives, right? It’s God’s love letter to us, so it’s easy to think that everything written in the Bible is something we should do. Right? Right but wrong. One of the easiest ways to misinterpret Old Testament stories is to assume that because it was said or done in Scripture, that means we should do it, too. Wait, wait! Don’t go! This isn’t heresy I’m talking here. Just hear me out. Especially when it comes to Old Testament stories, some of the things that the Bible says are the bad guy talking. It’s an important part of the story, it’s part of the story God is telling us (and the story is for us), but if Scar from The Lion King told the hyenas something, would you think that was a good thing? Of course not! This seems really obvious to us, but so often people misinterpret Old Testament stories by taking certain verses out of context – out of the stories they are placed in – and totally miss the meaning because they lose track of who is talking. [click_to_tweet tweet=”This seems really obvious, but so often people misinterpret Old Testament stories by taking certain verses out of context – out of the stories they are placed in – and totally miss the meaning because they lose track of who is talking. – @RealWorldBible” quote=”This seems really obvious to us, but so often people misinterpret Old Testament stories by taking certain verses out of context – out of the stories they are placed in – and totally miss the meaning because they lose track of who is talking.”] Check out this example from the book of Job: As Job loses everything – children, wealth, health, friends, Job’s friends assume that he has somehow sinned and is being punished for that sin. If we read the whole story, we know that isn’t true; God considered Job a righteous man! Scripture testifies that God “makes the sun rise on both the evil and the good and sends rain on both the righteous and the unrighteous” (Matthew 5:45 CEB). But if we read the words of Job’s friends, we might come to the (false) conclusion that if someone is going through a tough time, it must be because they have sinned. In fact, I bet you’ve had someone say that to you when you were going through a hard time. Stuart and Fee call this a “monkey-see-monkey-do” reading of the Bible. They remind us that “you can always learn a great deal from [Old Testament] narratives, and from all the Bible’s narratives, but you can never assume that God expects you to do exactly the same thing that Bible characters did or to have the same things happen to you that happened to them,” unless it is something that Christian believers are commanded to do. (How to Read the Bible for All It’s Worth 105). (Read more here about how to know if you should follow Old Testament laws). [click_to_tweet tweet=”Do you have a ‘monkey-see-monkey-do’ view of the Bible? If so, you’re missing out on so much of what God’s Word has to offer! – @RealWorldBible” quote=”Do you have a ‘monkey-see-monkey-do’ view of the Bible? If so, you’re missing out on so much of what God’s Word has to offer! “] So how do you test it out? Know the context. What do you have in common with the person or people in question? If you’re dealing with a comparable situation to the one in the story, AND the rest of Scripture supports what you found, then it is probably something you should follow. For example, the way Ruth takes care of her mother-in-law Naomi is consistent with what the rest of the Bible teaches about honoring your parents. On the other hand, the way Ruth reaches out to Boaz wouldn’t be an appropriate dating practice in a different culture, and nowhere are we instructed to do what she did in that situation. While Scripture is not always plain or easy to understand, it isn’t secret, and you are not going to find something that no one else has found before. Ouch. I know. Sometimes we don’t like the plain meaning of the text, so we treat it like an allegory or otherwise try to look for the hidden meaning behind the text, so we don’t have to deal with the tough stuff. The truth is that the Bible is a real world book (or 66 of them…), full of real messy real world stuff. There are allegories in the Bible, but they are not in the historical narratives (historical stories). It can’t be both. Don’t misinterpret Old Testament stories by assuming they mean something other than what they say. Instead of searching for a “hidden” meaning, use good rules of interpretation to understand what it meant for the original audience, and what it means for us today. There are two problems with this approach. 1) Sometimes we read something into the story that just isn’t there, in search for the moral. In the example above, we don’t know diddly-squat about how the Israelites handled adversity. 2) These narratives are in the Bible to show God’s work of redemption played out over time. Their primary purpose is not usually to tell us “this is why you shouldn’t lie.” Some of these stories make great illustrations for morals taught elsewhere in Scripture, and it’s awesome to use them this way. But if we are just looking for the moral, we miss the big picture. How do you know why a story is there or how it should be read? We can often understand the genre, or the type of story, from the context. 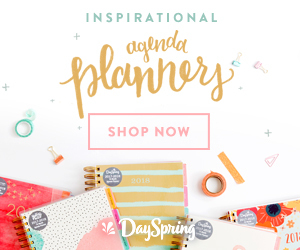 Here’s a New Testament example: “One day Jesus told his disciples a story to show that they should always pray and never give up” (Luke 18:1 NLT). We know there is a moral to that story, and we know the primary purpose of the story. 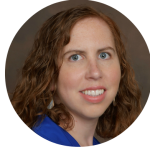 Old Testament writers don’t always come right out and say it like that, but we can look at the genre of the book to get an idea. The Old Testament historical books are meant to be that – history. To quote Tremper Longman, “the book of Genesis is not a history-like story but rather a story-like history” (How to Read Genesis 27). They are theological history – history with a God-purpose behind what is said and how it is said – but they aren’t parables or allegories. I want to be careful here…this isn’t to say that we can’t learn morals or other lessons from Old Testament stories. We just want to make sure we look at the context and understand what the story was meant to teach first, so we don’t read anything into it that isn’t really there. AND we get the main points before the subtext. For example, it is easy to see the evidence in the story of Jacob, Rachel, and Leah (starting in Genesis 29) the damage done by polygamy. On the other hand, when we read the first creation account in Genesis 1, there isn’t really a “moral of the story.” We learn about God and his handiwork, but there isn’t a “like so-and-so, you should/shouldn’t do x.” By the way, if you want to learn more about how to understand Old Testament narratives (and how not to misinterpret Old Testament stories! ), I recommend you check out (you guessed it) Stuart and Fee’s How to Read the Bible for All It’s Worth. It has a great chapter entirely dedicated to this subject. I might step on some toes here. But Old Testament stories aren’t designed to prove the existence of God or the idea of creation by intelligent design. Why? Well, everyone believed in God or gods back then. And everyone believed that those gods created the universe. Since “the Bible can’t mean what it never meant,” we know that Old Testament stories could not have been written to argue things that weren’t an argument in Bible times. When we use them for those modern-day arguments, we miss the point because we stop asking questions. Let’s use the creation stories as an example. You guys, this is so important. This is one of the biggest ways that we misinterpret Old Testament stories (and the rest of Scripture for that matter). Remember how there are a few different steps to interpreting the Bible? First, we need to understand what it meant back then, to the original hearers (exegesis). This first step protects us from making the Bible mean something that the first audience would never have understood. Then, we understand what it means in the light of the rest of Scripture. And then finally, we can figure out how to apply it to our lives today (hermeneutics). We want to know what the Bible means for us – for our real lives. And it has great stuff to say for our real lives. Every situation imaginable…God’s got something in his book to help us through it. But to make sure we arrive at the right conclusion, we have to start at the beginning and not at the end. 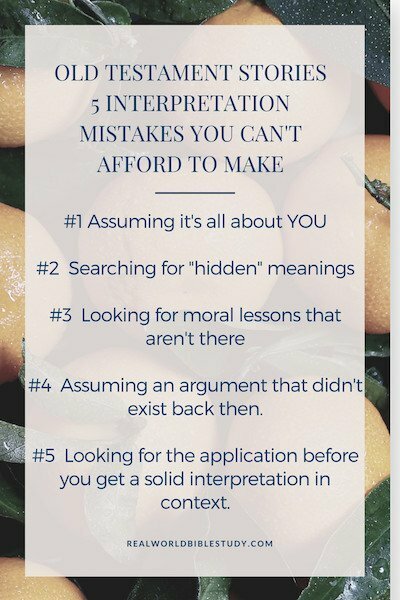 Have you made any of these mistakes? 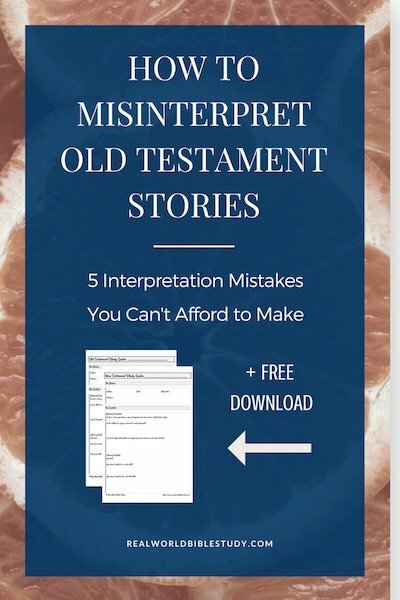 Have you been one to misinterpret Old Testament stories? I know I have! I have even heard them from the pulpit and read them in Bible study books! At least we’re in good company. The task of understanding God’s Word for our lives is a precious one – and a serious one. The best way to avoid making these kinds of mistakes is to follow the rules of interpretation and know the context. The funny thing is that when we dig into the context of a particular passage – Old Testament story or other – we won’t just avoid making errors in our interpretation. The context actually helps us through some of those difficult spots. Even more, it brings the Scripture to life for us and shows us ways that it applies to our lives that we never would have noticed without a little work. If you want to go deep in your understanding of Scripture, I have a great free resource for you below. 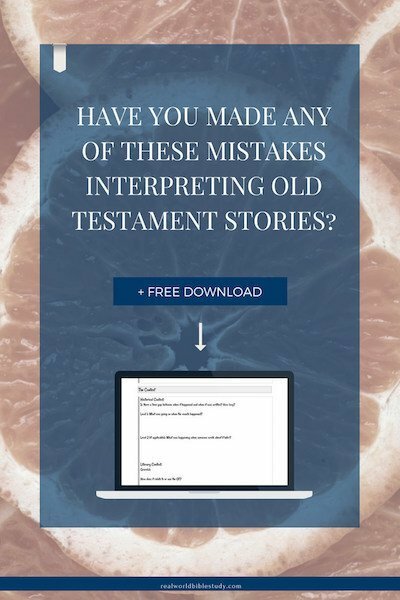 My Old Testament and New Testament Study Guides are simple printable templates that walk you through the questions to understand the historical and literary context behind each book of the Bible you study. Sign up below and start digging! If you have questions that you can’t answer as you go through the study guide for a particular book, take a picture of your study guide and share it in our Facebook Group for feedback from myself and our Real World Bible Study community! You can also jump in the comments below to share your interpretation questions. Have fun! All this digging feels a little Indiana Jones to me!